Self-professed geeks and recovering Wall Street guys, Stu Stern and Ed Schwarz founded Gorilla Logic to deliver world class software development and consulting services around mobile, Web and cloud applications. Companies rely on our high-performance, distributed Agile teams to enhance their existing resources and accelerate their time to success. Based at our nearshore development centers in Costa Rica and Colombia, our “Gorillas” are English-fluent, culturally aligned, and operate within the same time zones as our clients. They provide unsurpassed technology expertise and a passion for serving our clients. Clients First – or we’ll go out of business! 32 years, 2 startups and one rock band later . . . While bringing tech to Wall Street, Stu and Ed meet at a party, bond over music and form a band, Strategic Dance Initiative. Together they launch an amazing music software program – and quickly realize that the only people who would buy it have no money. Still in the tech game, Ed runs Sun Microsystem’s eBusiness practice, while Stu launches the Sun Java Center. Leaving their cush jobs, Stu and Ed consult by day and develop MonkeyTalk, a QA automation tool, at night. People actually pay for it. Stu jams to The Gorillaz while cruising down I25. An “aha” moment ensues, and “Gorilla Logic” is born. Oracle purchases MonkeyTalk. 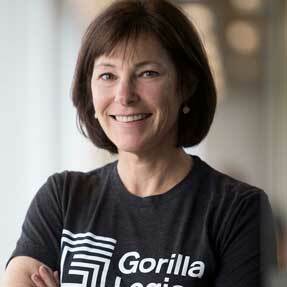 Gorilla Logic shifts focus to application development and lands a slew of fun, high-profile clients. The original band of Gorillas moves into their Boulder, CO, headquarters. The company opens a state-of-the-art development center in Costa Rica, home to over 500 Agile developers. Gorilla Logic reaches 500 employees! The company also opens another location in Medellín, Colombia to continue to expand our talent pool. Stu co-founded Gorilla Logic in 2002, after serving as founding VP of the Sun Java Center, Sun Microsystems’ global Java professional services organization. As VP of Equity Trading Systems Technology at PaineWebber (now UBS), he led the firm’s trading floor into the digital era. While living in NYC, Stu also fronted the 80s techno band, Strategic Dance Initiative (fans are still hoping for a comeback tour). A self-professed geek with more than 30 years of programming experience, Stu has hired literally hundreds of talented developers who are passionate about using technology to help customers transform their businesses. He occasionally slings code, and loves mixing it up with Gorilla Logic’s customers and engineers (“really smart people doing cool things”). An “alt-indie guy” who founded a music startup in the late 80s, Stu constantly cycles through new tunes while creating countless playlists. You can usually find him with his axe at Gorilla Logic’s monthly Boulder Geek Jam, or riding his bike at Flagstaff Mountain. Ed has been delivering software systems for an undisclosed number of years. Before co-founding Gorilla Logic, he was Director of eBusiness Consulting at Sun Microsystems. Back in the day, he was also on Wall Street exec’ing and tech’ing at Lehman Brothers and Moody’s Investors Services. After taking seven semesters of physics, Ed graduated from Princeton University with a degree in music. Realizing that musicians do really cool and glamorous stuff but don’t always get paid a lot, Ed landed a “real job” at a law firm where he built a system in Cobol to schedule the firm’s paralegals. Ed’s officemate (also a musician) introduced him to Stu, which led to the formation of Strategic Dance Initiative – and ultimately Gorilla Logic. Our Practice Leads, Area Engineering Managers and Technical Recruiters work together to ensure you get the best resources possible. Learn more about their unique experiences and passions. From emerging companies to global enterprises, we help our clients develop forward-thinking software solutions that drive growth and enhance customer experiences. In addition to being super smart, unstoppable developers, Gorillas band together in a fun-loving, collaborative community.